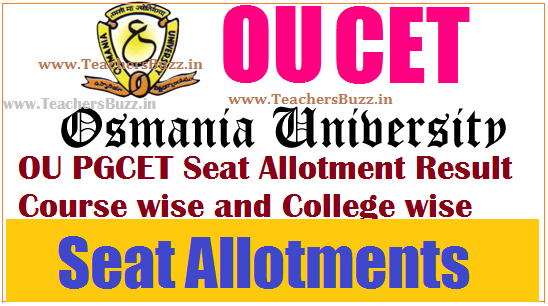 OUCET 2018 course wise, college wise and Candidate wise Seat Allotment. OUCET 2018 Notification for Certificate Verification All the candidates, who have exercised the OUCET-2018 web options, are hereby informed that the 3rd Phase Certificate Verification of the candidates, who are provisionally allotted for admission into different PG courses in different colleges for the academic year 2018-19 through web based allotment process, will be conducted. The day wise and subject wise schedules of certificate verification and related instructions are available in the website. Candidates are advised to read the instructions carefully and attend the certificate verification process with all relevant certificates and requisite fee. Candidates should note that the certificate verifications is only for those candidates who are provisionally allotted an admission through web based allotment process. The provisional allotments are placed in the website. The provisional allotment is subject to verification of eligibilities and rules inforce. Candidates can check their status of allotment of provisional admission in the website.Without attending the certificate verification, the candidate’s admission into a course will not be entertained and his/her allotment will be deemed to be cancelled. The provisional allotment is subject to verification of eligibilities and rules in force.In the subjects of M.Ed., M.P.Ed., M.L.I.Sc. (1 year course), M.A. (Philosophy), M.A. (Kannada), M.A. (Marathi), M.A. (Persian), M.A. (Tamil), M.Sc. (Nutrition & Dietetics), All PG Diploma Courses including PG Diploma in Taxation (under commerce stream) and in all 5 yrs. Integrated Programmes, the counselling for admission will be conducted separately. Candidates can edit / change their web options on . Exercising of 2nd Phase of web options for all the qualified candidates of OUCET-2018 will be open from . The candidates exercising 2nd phase web options must note that the web options exercised during 1st phase are no more valid and stand cancelled completely. Therefore, all the candidates have to exercise their web options freshly for possible sliding and for new admissions. The qualified candidates of OUCET-2018 are hereby informed that the final phase of certificate verification, exercising of web options and manual counseling will commence from 28.08.2018. The online payment for fresh registrations will be open from 25.08.2018 for those who did not registered earlier. All the candidates have to exercise their web options freshly for possible sliding and for new admissions. The detailed notification and related instructions along with subject wise schedules of certificate verification and manual counseling schedules are available in the websites: www.ouadmissions.com; www.osmania.ac.in. All the candidates are hereby informed that the Certificate Verification, Web Options entry and Manual Counselling will be started from as per the below given schedule. The online payment for registrations will be commencing .. The candidates of OUCET–2018 who have not attended for first / second phase certificate verification shall get their certificates verified from any of the decentralised verification centres. The candidates who did not pay registration fee in first / second phase should pay the registration fee of Rs.250/- for OC/BC candidates and Rs.200/- for SC/ST/PH candidates has to be paid by candidate through online payment mode before proceeding to certificate verification, which is mandatory. Only those candidates who paid registration fee are allowed for certificate verification at various centres. The Decentralised Certificate Verification will be done at the following University centres. Candidates can choose any of the following university centres for their certificate verification as per the below schedule. - Notification for Final Phase of Web Options in Osmania,Telangana, Mahatma Gandhi and Palamuru Universities, its Campus, Constituent and University PG Colleges. Exercising and editing the web options for Special category candidates of NCC/NSS/SPORTS are available up to 24-08-2018. Once the candidate exercised the web options in general counselling is no need to do again. The options exercised for 2nd phase counselling were considered for special category allotment, but if they wants they can edit their options.